Both the mountainous location and the political setting of the earthquake led to delays and massive transportation problems. 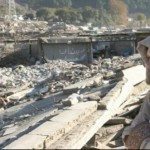 An earthquake of magnitude 7.6 struck Pakistan on October 8, 2005, and, because the epicenter as well as most of the destruction occurred in the Pakistani-controlled portion of Kashmir, it also came to be known as the Kashmir earthquake. Because of the inaccessibility of the high mountainous area that was hit, casualties and costs were both very high. More than 73,000 lost their lives and costs mounted to $5 billion. Immediately after the earthquake, landslides blocked the steep, winding paths and donkey trails that constituted the only access roads to where most of the people lived. The United Nations estimated that at least four million people were affected and the medical, food, and clothing needs were acute as winter was approaching. In addition, it took some time to arrange for permission for assistance to be sent from the Indian side through Kashmir. The border is tightly controlled and there is frequent fighting between guards on both sides. In addition to the destruction in Pakistan, many parts of Afghanistan and India experienced substantial damage. Kashmir lies in the area of collision of the Eurasian and Indian tectonic plates. These plates are constantly moving against each other with the Indian Plate subducting beneath the Eurasian Plate. This movement was how the Himalayas came into existence. It is a land illustration of the subducting actions that take place all the time all around the Pacific Rim. Wherever activity of this kind is happening there are earthquakes as frictions or stuck plates allow tensions to build up until there is a sudden release. The earthquake in this Kashmir earthquake had an epicenter sixty miles northeast of the Capital of Pakistan, Islamabad, and sixteen miles below the surface. Numerous aftershocks occurred, some of them as strong as 6.2. As Saturday is a normal school day in the region, most students were at schools when the earthquake struck. Many were buried under collapsed school buildings and parents were seen frantically digging with their hands to rescue children. Two days after the quake, the World Food Program pointed out that 500,000 people in remote areas had not yet received any aid. One of the biggest problems was meeting the demand for tents that could provide shelter as the cold weather worsened. Fears mounted about a second wave of deaths from untreated injuries and exposure. UNICEF distributed 110,000 winter kits for children living above the snowline, including snow boots, padded jackets, shawls and socks, as well as half a million blankets. An additional 350,000 quilts were being provided thanks to the support of IKEA. Many volunteer agencies from many countries including the United States were on hand to help, but often it was almost impossible to reach those in need. Even helicopters had trouble landing on the slopes because they are so steep. The Earthquake Engineering Corporation of Pakistan showed that most of the buildings in the earthquake zone were built of non-reinforced concrete blocks and, accordingly, most buildings collapsed. Landslides were another contributing factor in the high level of destruction. They buried homes and the occupants inside were killed when their homes came down. In Islamabad two residential high-rise buildings collapsed from the shaking that accompanied the quake. An international rescue corps was able to rescue some people a few days after the earthquake but they had great difficulty securing silence in order to use sensitive sound equipment for detecting life.